A bit late but heres our update on our Canal Day in Banbury. The event was opened by the Mayor and the sponsors who arrived on our day boat - the 'Dancing Duck'. Then the Duck when on provide boat trips for the rest of the day. At the boatyard we opened the site for the general public giving the full access to the yard. On the canal side in front of the dock we had a pig roast with our restaurant boat 'Rosamund the Fair' providing the bar. We also had old cast iron forge that we saved from Alcan (Banbury's old aluminium works) when it closed. Its nice having this old forge as it was made in Samuelson's Foundry in Banbury. 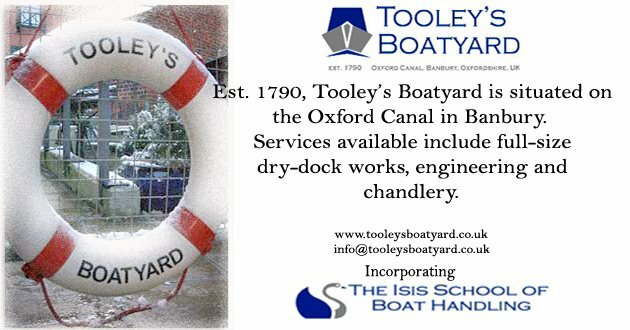 The interesting thing about it is that the Tooley's used to supply coal and pig iron to the site by boat - so maybe the Tooley's supplied the fuel and metal to make this forge. So what a fitting place for this to end up. 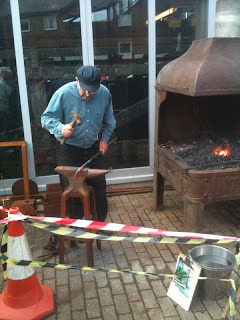 We have restored the forge back to running order and Ron did demonstrations on the day. We also had our 200 year old forge up and running with demonstrations running through out the day. Our Chandlery was open as usual and was packed full of people all day. We also had a display of Roses and Castles painting in the yard and we took bookings for our painting classes. Here in this picture you can see Atlanta an old working boat in the dock. The dock is normally dry so we can work on boats out of the water, but on the day we had the dock full of water. 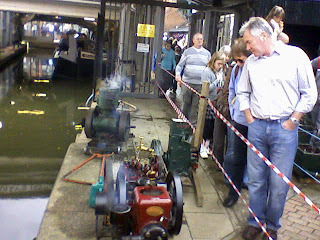 You can also see some old engines that have been restored and being displayed by Pete Downer and friends. Well the day was a success and thousands of people came down to the canal saw different things and enjoyed the day by the water. And thats what our Canal Day is all about.